Shares of Charter, one of the country's largest cable companies, surged on Thursday after the Wall Street Journal reported that Verizon is plotting a takeover. "Verizon CEO Lowell McAdam has made a preliminary approach to officials close to Charter and Verizon is working with advisers to study a potential transaction," the Journal reported, citing anonymous sources familiar with the matter. The Journal said "there's no guarantee a deal will materialize." Charter shares were up more than 5% by early afternoon Thursday. Verizon shares were down about 1.2%. A Charter spokesman declined to comment to CNNMoney. A Verizon spokesman did not immediately respond to a request for comment. In recent weeks there has been industry chatter and market speculation about a possible Verizon move. The New York Post reported last week that Verizon is "mulling" an acquisition of a "big cable company," possibly Charter. Charter sells cable TV and broadband subscriptions in local markets across the United States. Through a recent merger with Time Warner Cable, Charter now operates in big cities like New York City and Los Angeles. 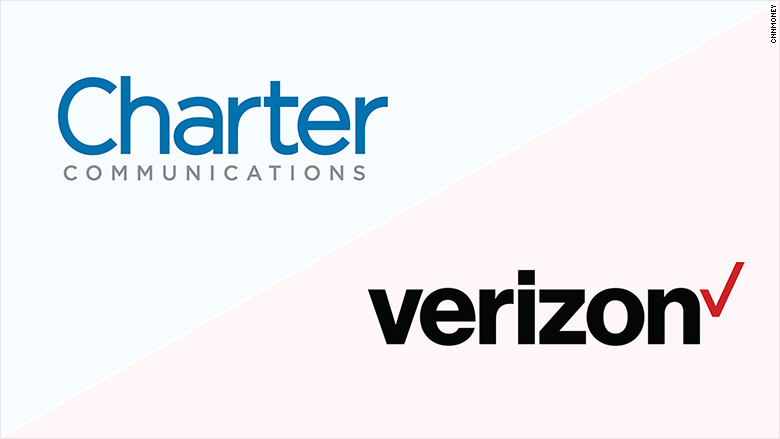 A Verizon acquisition of Charter could be seen as a response to AT&T's acquisition of DirecTV and its pending acquisition of Time Warner. Verizon and AT&T are the two biggest wireless providers in the U.S. Through DirecTV, AT&T is one of the country's biggest providers of subscription TV. So is Charter. AT&T announced an $85 billion bid for Time Warner, CNN's parent, in October. The deal is now working its way through the regulatory process. President Trump has previously vowed to block the deal, but executives at AT&T have expressed optimism that it will gain approval.